Written during the winter of 1857-8, the "Grundrisse" was considered by Marx to be the first scientific elaboration of communist theory. A collection of seven notebooks on capital and money, it both develops the arguments outlined in the Communist Manifesto (1848) and explores the themes and theses that were to dominate his great later work "Capital". Here, for the first time, Marx set out his own version of Hegel's dialectics and developed his mature views on labour, surplus value and profit, offering many fresh insights into alienation, automation and the dangers of capitalist society. 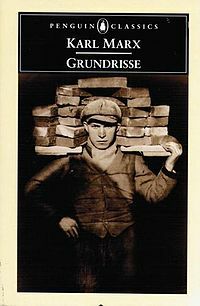 Yet while the theories in "Grundrisse" make it a vital precursor to "Capital", it also provides invaluable descriptions of Marx's wider-ranging philosophy, making it a unique insight into his beliefs and hopes for the foundation of a communist society.